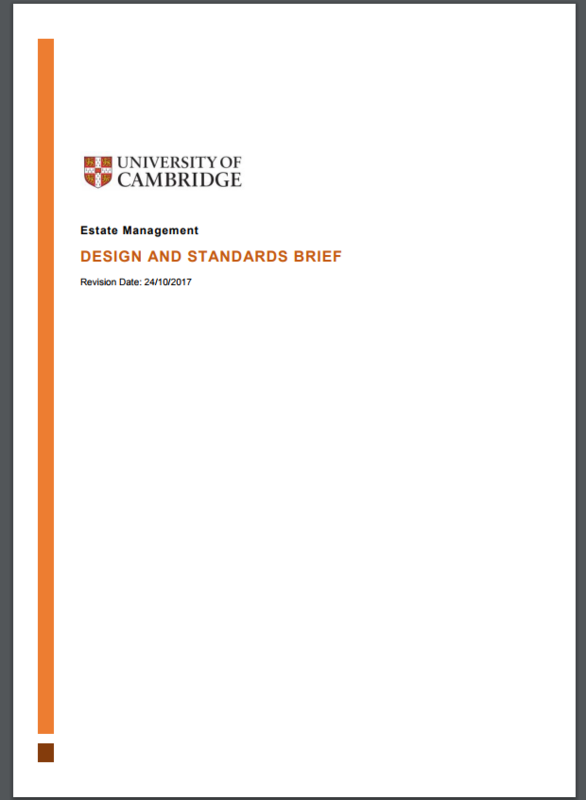 The University's new Design and Standards Brief (D&SB) provides technical guidelines for the construction and maintenance of University Buildings. This replaces all previous versions and is now in operation. It has been applied to and used on all new Estate Management building projects as from January 2018; it should be applied to all other University building projects, including those carried out under the University’s Sites and Buildings Regulations, as from March 2018. The new D&SB should be adopted for projects in progress insofar as its requirements do not conflict with terms of confirmed appointments and contracts. The new D&SB covers a wider range of requirements than before including requirements of the Environment and Energy Section, the Strategy and Planning Section, the Occupational Health and Safety Service, the Disability Resource Centre and others. a. Further reconciliation between D&SB requirements and value for money objectives as defined by the Government and funding organisations. b. Further development towards more performance based requirements to enable the University’s supply chain to achieve better value for money through procurement. c. Improved alignment with Estate Strategy, for example, though inclusion of Space Standards. d. Further refinement and development of the Environment and Energy section. e. Further development of Accessibility requirements. f. Confirmation of links with information held elsewhere. Work on confirming University policy is required in some of the development areas identified above and, for example, a new Sub-Committee on Accessibility has been formed to develop policy in place of advice. As new policy is formally confirmed by the University, it will be reflected in future revisions of the D&SB. A Feedback Form is provided here and all are strongly encouraged to put forward corrections, comments, recommendations and suggestions. Feedback of any kind is welcome. Please email the completed form to Sandra.Hobbs@admin.cam.ac.uk, cc to John.Neve@admin.cam.ac.uk. Publication and review of the D&SB is managed by the Deputy Head of Estate Projects. The new D&SB is owned by the Technical Advisory Group (TAG) which includes the Director of Operations, the Head of Estate Projects and the Head of Estate Facilities. It will be maintained through the processes of the Project Engagement Meetings (PEM) which includes University Advisors and others who are members of the Projects Quality Team.